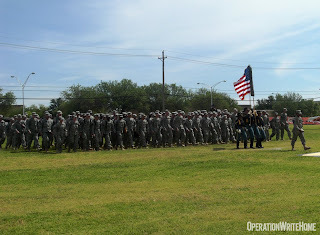 Thank you from all of Charlie Co 701st BSB. Thank you so much for all the cards. I shared them with all my co-workers at the TMC and with all the patients that come in to the clinic. I can tell you that everyone loved the cards. We are doing okay. The weather is changing here again..we are having sand-storms again. 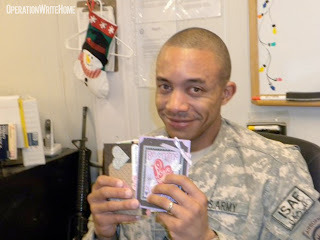 I love the cards and tell everyone that all the soldiers just sit there and ooh and aaah over them. I wanted to update you on whats been going on with my life. I have completed my active duty obligation and got out this past September and have gone on to the National Guard. 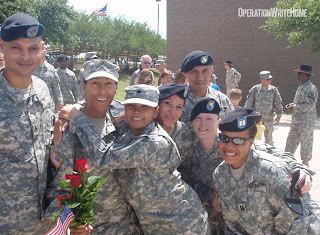 I moved from Killeen, TX at FT Hood to Fayetteville, NC and will soon start a civilian position as a Physician Assistant. I will still work with soldiers preparing to deploy as well as those returning from their deployments. I have 2 colleagues presently overseas. 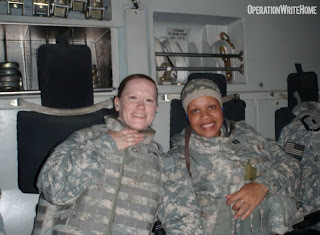 I believe they have a few months left and if you are still sending care packages out to soldiers I would like to hopefully add my 2 friends to your list if possible. 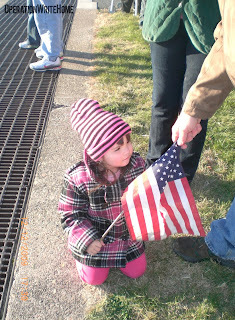 I am so so deeply thankful for all of the support you gave me from 2008-2009 when I was deployed. My soldiers couldn't thank you enough. I still have all of the letters, cards and drawings and will forever keep them in a keepsake box. It is very dear to my heart. I'd like to order another box of cards. We received a box a few weeks ago with the valentines cards. 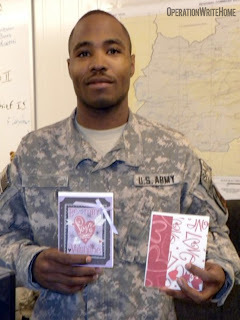 We kept a few cards for our unit then we divided it up and sent the rest of the cards to soldiers at smaller locations with less rescouces. I would like to do this again, if possible. The response has been overwhelmingly positive and it keeps the morale of our soldiers extremely high. We appreciate your support of our unit. 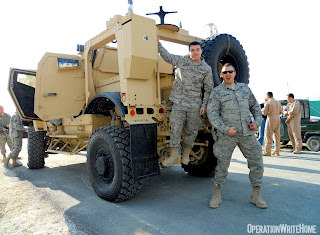 Additionally, many soldiers have asked what they can do to support your organization. Many have asked if they can make monetary donations to help with the postage, etc. Thank you again! 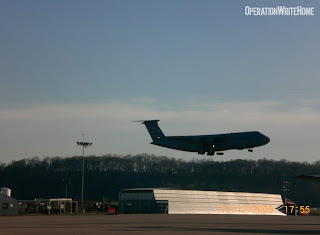 These photos were posted on our wall by Msgt E.G. in Afghanistan...what a good-looking bunch of heroes! 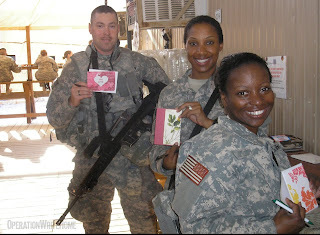 On behalf of our wonderful troops, and the USO, I want to thank you so very much for the beautiful Valentine's Day cards you sent; actually they are almost all gone! The troops have enjoyed making their selections and sending the cards home. I've attached a photo as a testament to this! We always look forward to receiving a box from Operationwritehome.org! Greetings Ms. Sandy. I pray that you are well on this great day. I want to thank you for those lovely cards and words of encouragement. Those cards that you all make are absolutely marvelous and loved by all. You must have a whole lot of people working to produce so many. My replacement is here and I will be returning to the states soon. I will send you his information tomorrow. I am sure that they would be happy to continue to receive them as you have some available. I will also send you the name of a civilian worker in Baghdad who supports Army and Air Force service members. I am sure they woule like some also. Thanks for you gracious support. Just to let you know I received the box of cards you sent. I gave a few to our Soldiers in camp. The majority will go to camps who have limited resources to correspond with loved ones. A team is going out next week and so will the cards. Dixie do I go back on the OWH website to request additional package or just request more from you? I want to thank you for the wonderful cause you are in. You are the best!! I just wanetd to take this time to thank you for your wonderful care package. It means so much to us that you have taken the time to keep us in mind over here, and to send us just a little taste of home. I can't een begin to tell you how much it means to us. I love to see the faces of the Airmen, Soldiers, Sailors, and Marines that I share the packages with. It is almost like Christmas all over again when we get our shipment of mail in. People crowd around our offices and watch as we open things up. We make sure to share all of the packages that we receive not only with the Soldiers on base, but also the coalition forces that are here providing security for us at the gates. It makes their day when we come by to check on them, bringing them wonderful surprises. A lot of the coalition forces come from very poverty-stricken backgrounds, so we like to help them out whenever we can. I would also like to say sorry that it took so long to get this thank you card out. The mail system here is ridiculously slow. It takes us over a month sometimes to even receive the packages sent to us, and then at least three weeks for our cards to make it to you. We just want you to know that what you ahve done is appreciated because it is YOU that is making a difference in our lives every day. Thanks to people like YOU, we can keep performing our mission, knowing that there are those still in the world that are back home supporting us. So THANK YOU for what you do for us! My name is CPL M. M. and am currently serving in [unit name] with the Marine Corps. 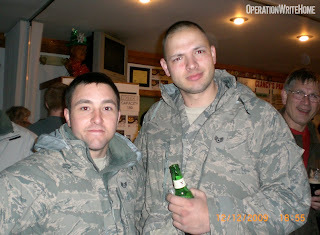 Well I am writing because a couple months ago we just replaced [unit name] here in Helmand, Afghanistan. And when doing so I found a box full of cards and was very happy to have found such a lovely gift. So I would like to thank you for the lovely gift you sent out here and let you know all the Marines in my platoon are so grateful to have them. So again Merry Christmas and Happy Holidays. Thank you so much. Feel free to stay in touch. My stepson has served three deployments in Afghanistan. On this last deployment, I made some cards to send to him and for of the buddies he was working closest with, to go with a care package. We just received a thank you card from one of them, and I could tell immediately that it was homemade. When I looked on the back, I saw your stamp. 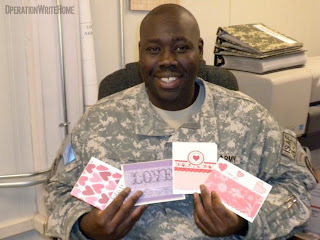 I would love to make cards to be sent home, as well as send cards for our service people. I will also send this address to some friends of mine who are stampers/scrappers as well. 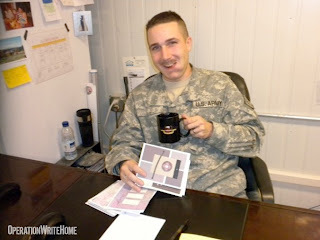 One of our heroes is home...you may have seen Maria O posting on our Facebook Fan Page about her husband — these photos of are her sweetie, who we sent cards to! Here's the plane on it's way in....and Maria and Matt's little girl waiting! 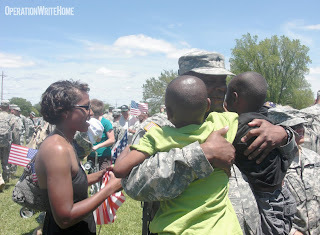 Welcome Home, Staff Sgt. O.!! Effort you put into it and the love it takes is VERY VERY far reaching! Sandy, Thank You! I got the wonderful box of cards today and will get the distributed for all here to use. I know I write home a whole lot, I try for about two letters a day. It's very nice writing from an APO address because stamps aren't needed, you know you just write FREE in place of the stamp. I am a believer that nothing is free but writing "at no additional charge to sender" is too long! The regular mail goes space available out of here so it takes anywhere from 3-6 WEEKS to get there! But the wait sure beats the cost of stamps these days. I hope you and your family had a wonderful Christmas and New Year. Thank you again for all that you do. I know it's no small effort to coordinate and distribute these cards to so many people, so always remember that the effort you put into it and the love it takes is VERY VERY far reaching! An email received by a cardmaker, who had her contact info on the label on the back of her cards! I cannot begin to tell you how popular your cards were. 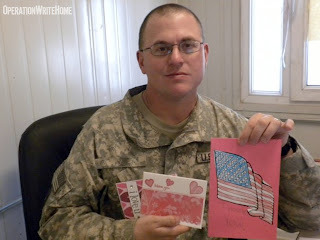 I watched as Marine after Marine searched through for the perfect Miss You or Valentine Card to send their loved one. Within one week I had to keep refilling the small card box I put out. Your organization has inspired many people to write home. Please thank all the people who helped with your effort. Spread cheer across the miles - kept morale at an all time high! Thank you so much for your rapid reply! We did receive your email. I just spoke with SPC R., and unbeknownst to each other, we both placed orders for the cards. Ma'am, if it is possible, would you mind sending a separate box to each of us? Although we receive mail at the same building, we represent separate units. Under our roof, there are 6 different units with a total of about 75 people. The units prior to us left some cards that they received from you. They were such a big hit around here! I have never seen so many grown men and women writing cards to their loved ones. It was fantastic! And the feedback from the folks at home was amazing! 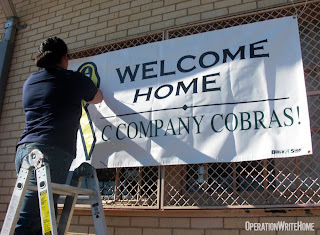 Without a doubt, your organization has spread cheer across the miles and has kept our units' morale at an all time high! We wish you and all of the OWH folks a blessed New Year! Thank you! This is from our hero, Eileen, who received cards while deployed, then was injured in a traffic accident once she got back to the States. We sent her a box with thank-you cards to use, as well as a lot of AnyHero cards for her! Sandy just wanted to tell you that the thank you cards that were sent to me were great and the written get well cards were great too. 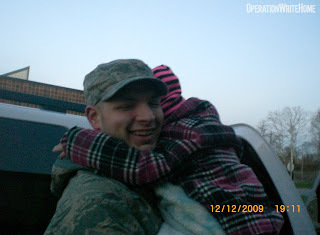 They picked me up when I was home from the hospital. 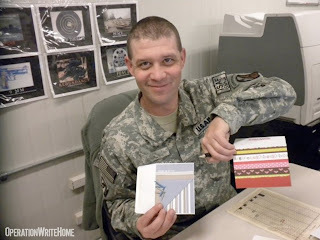 My suggestion is that if you write a short note to the soldiers it would be nice if you put a return address on your card, maybe they will write back. 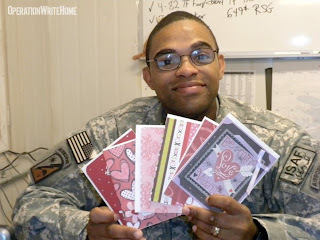 When I received cards and packages (I was on www.Anysoldier.com and I received lots of things for the people and I wrote back to everyone that wrote me just like I am doing with the get well cards that I received during my accident.The cards are beautiful and I love sharing them with friends and family. Please keep up the great work that you all do with this website.